Bulk density is a defining property of any powder, minerals granules or any other ingredients that may be utilized in your manufacturing process. 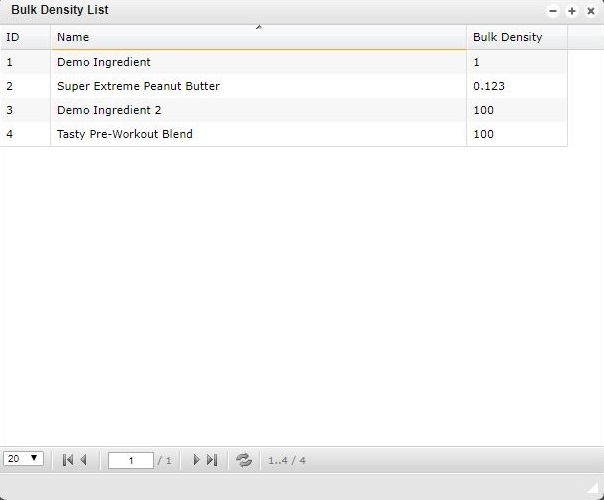 From the Bulk Density window, you have the option to sort ingredients by their given Bulk Density, Name or Ingredient ID. Double-clicking an ingredient expands more information about the ingredient and allows you to edit any existing information as needed.